Last fall I listened to the audiobook of Vanessa Diffenbaum’s The Language of Flowers. I loved it so much (the narrator, yes, but especially Diffenbaum’s story) that it actually ended up being one of the picks on my 2011 ‘Best Books’ list. 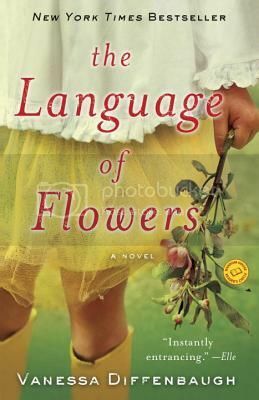 The Language of Flowers would make a wonderful book for a book club, and now it meets the most important criteria for so many book clubs: it is in paperback. To celebrate the recent paperback release, Ballantine is offering one copy to a Devourer of Books reader with a mailing address in the US or Canada. To enter, fill out the form below by 11:59 PM Central on Tuesday, May 1st. This was one of my favorite audios last year as well. I loved the story and narration. I would love a copy of the book. Did you notice her name is spelled wrong in your title? Just thought you would want to know. I have had this book in my hands many times this last week and had never heard anything about it till now. I want to read it!! I’ve been hearing about this book in all corner of the blogosphere lately. Clearly I need to read it.